CMC leads well over 200 hikes per year. This requires many hike leaders. Each needs some hiking experience and leadership training, and needs to commit to leading at least one hike per year. Leading a hike takes a little more time than just hiking, because the hike needs to be scouted ahead of time, and there is some preparation and paperwork required. But leading a hike can be fun, and is a great way to really learn the trails you lead hikes on, and the routes to the trails. You can find your own strengths and build on them as you develop your own style and hike preferences as a leader. Go to Hike Leader Guidelines for more details. Trail building and maintenance is part of our long tradition. Figuring out how to approach a trail job, sweating and getting tired and dirty, then standing back and admiring your results can be very rewarding, as can the camaraderie of working with others. We have trail work opportunities for folks who already have the skills, as well as folks who are ready to jump in and learn something new. We have opportunities for those who can work weekly, and others for folks who can only come out a couple times a month or a few times a year. There are options for people who prefer groups, and for those who prefer to work in pairs on their own time, for those who are strong as an ox and for the rest of us. 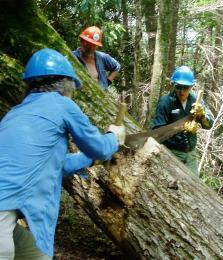 Go to Trail Work and associated links, especially Trail Work Schedule, for details. CMC has a group of committees that represent the gamut of our activities, and they present opportunities for folks with a very wide array of skills and interests. You can contribute your current skills and learn new ones. You can put to use skills that you've developed within CMC or elsewhere, as fresh viewpoints can be as useful as experienced ones.